These cute little biscuits are shaped like little teddy bears, coming in 6 different shapes making them great fun for kids. 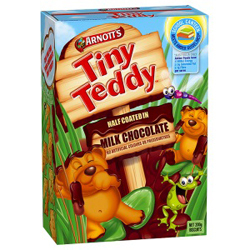 They are half coated in milk chocolate making these teddies even tastier. This reminds me of my childhood days, I used to have these as a kid at school as a snack, although had never tried the half coated chocolate ones before only the chocolate and honey ones. They are so good I would recommend them. Plus I love the way each teddy has a different expression :) a bit like Pom bears.